For example, the auxiliary port on Cisco routers can be used to connect a modem and allow out of band (not via the network) management. The Cisco AS5300 is an example of a device that supports both synchronous and async communication, such as voice, digital, and modem-based traffic (via a Public Switch Telephone Network [PSTN]). The AS5300, or universal Access Server (AS), is a versatile data communications platform that provides the functions of an access server, router, and digital modem in a single modular chassis. The access server is intended for ISPs, telecommunications carriers, and other service providers that offer managed Internet connections. The AS5300 provides both digital (for example, ISDN) and analog access (dialup users using PSTN) to users on a network. Figure 2-20 displays a typical scenario where clients, such as Internet dialup users with ISDN and analog phone lines (PSTN), can connect to the Internet using PPP. Users, such as clients with ISDN, call the dedicated number supplied by the ISP. The four AS5300s in Figure 2-20 can also share the load of incoming calls using Stack Group Bidding Protocol (SGBP), which is used when multiple PPP, or multilink PPP (MPPP), sessions are in use. When SGBP is configured on each Cisco AS5300, each access server sends a query to each stack group member. A stack group member is a router running the SGBP protocol. Each router participating in SGBP then bids for the right to terminate the call. The router with an existing PPP session, for example, will win the bid; this allows the best bandwidth allocation to the end client, as both PPP sessions are terminated on the same router. If the PPP call is the first session to be terminated on the AS5300, the AS5300 with the lowest CPU usage will have a higher probability of terminating the call. Example 2-21 displays a typical IOS configuration when SGBP is enabled on the four AS5300 routers in Figure 2-21. The following list explains the IOS commands used in Example 2-21. 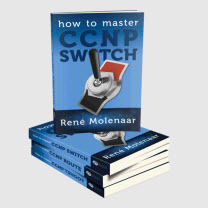 • sgbp group CCIE—Defines a named stack group and makes this router a member of that stack group. Use the sgbp group command in global configuration mode. To remove the definition, use the no form of this command. • sgbp member ip-address—Specifies the host name and IP address of a router or access server that is a peer member of a stack group. Use the sgbp member command in global configuration mode.